Author, inventor and controversial UFO advocate. Some agreed, some disagreed with his philosophy. None found him boring. George Van Tassel, creator of the Integratron, was a legendary figure, an aeronautical engineer who worked for Lockheed, Douglas Aircraft and as a test pilot for Howard Hughes at Hughes Aviation. He was also one of the leaders in the UFO movement who held annual “Spacecraft Conventions” at Giant Rock for 25 years. 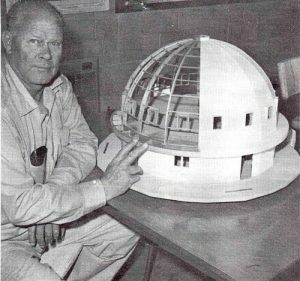 Van Tassel said UFO contact and channelings and ideas from scientists such as Nikola Tesla led to the unique architecture of the Integratron. He spent 18 years constructing the building. Van Tassel learned of Giant Rock from Frank Critzer, a prospector and desert dweller, who had excavated under the massive boulder to construct a dwelling of several small rooms protected from the fierce sun. Critzer had been killed in a explosion of the dynamite he kept stored in his rooms, the circumstances of which are still a mystery. The gutted rooms became storage for the Van Tassel family, but they slept outside the Rock and during the day tended the airport and their small cafe. His annual Spacecraft Conventions were attended by tens of thousands across two decades, featuring speakers that included high profile UFO contactees and pioneers in the fields of antigravity and primary energy research. Van Tassel led weekly meditations in the rooms under the rock from the 1950’s to the 1970’s, which he claimed led to UFO contacts. The family hosted UFO conventions at Giant Rock (3 miles north of the Integratron) for almost 20 years to raise money for the Integratron project. In 1959, 11,000 people attended the spacecraft convention, and Van Tassel continued to work on the Integratron while writing a number of books on time travel and rejuvenation. Van Tassel died suddenly in 1978, after which the buildings at Giant Rock were vacated and gradually vandalized until the Bureau of Land Management found it necessary to bulldoze the remains. Read George Van Tassel's "Brief History of Giant Rock"
The Integratron’s Landmark Nomination was approved in April of 2018 and is now listed on the National Register of Historic Places. Prepared and written by Daniel Paul, noted architectural historian, this document covers George Van Tassel’s role in UFOlogy and the design and build of the Integratron through its history. George Van Tassel published and distributed these newsletters from 1953 until his death in 1978. His widow published one more newsletter in 1979. The College of Universal Wisdom was dissolved shortly after George’s death. Chef and best-selling author Anthony Bourdain visits the Integratron. Huell explores Giant Rock and the Integratron. Please carefully read the following information, and follow the instructions below to make your appointment. During a private Sound Bath session, you will have the entire Sound Chamber for your own party and will not share it with others. This is a one hour appointment and follows the same format at the public Sound Bath sessions. 30 people is the maximum group size. The followings fees are flat rate totals for each group size. We ask for a deposit at the time of booking to hold and confirm your reservation; this will be anywhere from $100 – $300 and will depend on the size of your group. The balance is due on the day of your appointment. Cancellations must be made 14 days or more prior to your appointment time in order to receive a refund of your deposit. Email us at integratron@gmail.com if you need to cancel your reservation. We also require at least 14 days’ notice to move a booking to another date. There are no refunds or credits given for missed appointments. Children aged 5 and up are welcome in the private sessions. Children MUST be supervised by an adult at all times while on the Integratron property. Available by appointment only, Wednesday-Sunday. Wednesday/Thursday appointments book 1-2 months in advance. Friday – Sunday appointments often book up 3-4 months in advance. We do not schedule private Sound Baths near major holidays (Easter, Memorial Day, Labor Day, Thanksgiving, Christmas, New Year’s Day). We are always closed on Thanksgiving Day, December 24-26, Mother’s Day and Father’s Day. The Integratron is a NO PET property, with the exception of certified service animals. Do not bring your pet or emotional support animal please. Also, no animals are allowed inside the Integratron at any time. There is a short but steep set of stairs you must climb to get to the upper level of the Integratron, where the Sound Bath takes place. We will always do our best to help anyone with mobility issues experience the Sound Bath; please see our FAQ page for more information. We provide mats, blankets, and pillows for all Sound Baths. GPS does not work well in our area; PLEASE check directions on our website before heading out. Please email us: info@integratron.com to book your private session. Please include your preferred date range, whether you prefer the morning or afternoon (we do not book evening/night appointments), and how many people you plan to bring. Please CAREFULLY READ the following information, and then click the “Book Now” button to make your appointment. The Public Sound Baths are one-hour group Sound Bath appointments, available by reservation only. We combine multiple requests into one group Sound Bath for those who don’t mind combining with others or are unable to secure a private appointment. The Public Sound Bath is conducted for 30 people, and is held in the Integratron Sound Chamber. These follow the same format at the private Sound Bath sessions. $35/person on weekdays, $40/person on weekends & holidays. For guests 14 years of age and older only. Please note that children MUST be supervised by an adult at all times while on the Integratron property. Through June, 2019 (we upload the schedule 4 months in advance). We are closed to the public for a restoration and maintenance cycle in July/August 2019. We require at least 7 days’ notice to either move or cancel your reservation for a refund. Please email us at info@integratron.com if you need to cancel your reservation. There are no refunds or credits given for missed appointments. We often sell out 4-8 weeks in advance for public Sound Baths. If you cannot select a certain day, we are either sold out or closed for the day. We do not maintain a wait list and cannot call guests hoping for cancellations. If cancellations open up spaces, they will be viewable on our calendar. Please keep checking back here periodically to see if anything opens up on your desired day. On a sold out day, you can come to the property and put your name on our Stand-By list. If we have no-shows, then we can include stand by guests in the Sound Baths. This is a good option if you’re going to be in the area anyway, although we can’t guarantee that spaces will open up. The list is first-come, first-served, and you need to be/remain on the property to take part. Please call us the day prior to see what times our Sound Bath sessions are. The Integratron is a NO PET property, with the exception of certified service dogs. Do not bring your pet or emotional support animal please. Also, no animals are allowed inside the Integratron at any time.